After crashing into Valtteri Bottas on the first lap, Vettel quickly and impressively recovered, even looking like he might be in with a chance of a podium at one point. But charging through the field wrecked his tyres, he had to pit again, and finished a distant fifth on a day where his team felt he should have been able to contend for the victory. But despite all of that, fans voted him as the ‘Driver of the Day’. That means that of all 20 drivers on the grid, they think he drove the absolute best - better than comfortable race-winner Lewis Hamilton, better than Carlos Sainz’s super drive for Renault, better than Charles Leclerc scoring points for the fourth time in five races. Of course there was some confusion at the fact he won and fans reacted accordingly. Interesting. 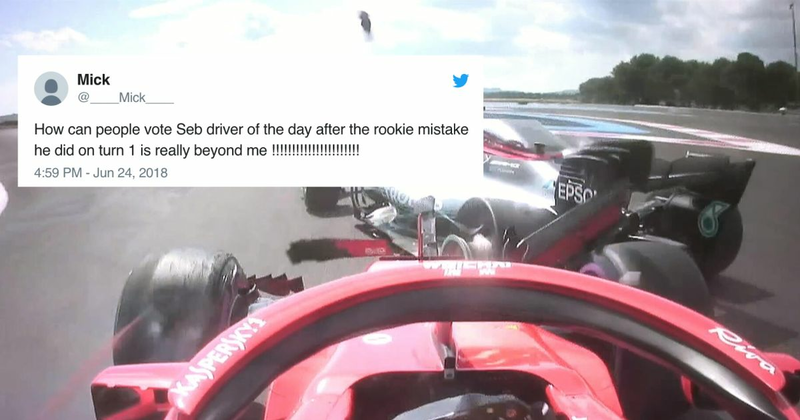 I would have given it to someone who didn't ruin their own race by running into the back of another driver, severely compromising both their races, but each to their own I guess. @KevinMagnussen should be driver of the Day! P6 is incredible! You don't get points for DOTD so why do people make such a big thing out of it? How can people vote Seb driver of the day after the rookie mistake he did on turn 1 is really beyond me !!!!!!!!!!!!!!!!!!!!!! Damn, Max Verstappen must be feeling robbed - by this logic he should have been voted Driver of the Day three or four times this season already! Of course, it doesn’t really mean anything, but this sort of thing is always going to happen when votes are opened up to the public - just look ‘Boaty McBoatface’, or how Rio Haryanto won the first Driver of the Day award back in 2016.
Who do you think would have been a worthy winner? Or was Vettel’s fightback really enough to overlook his first dodgy first lap? Let us know in the comments.